Harmonics (created by transformer saturation due to GIC) caused, by a “domino effect”, a collapse of the whole system in about one and a half minutes. Six million people were without electricity for several hours. Total costs 13.2 MCAD Malmö blackout -- October 30, 2003 About customers were without electricity in Malmö, southern Sweden, for minutes. The first (and so far only?) 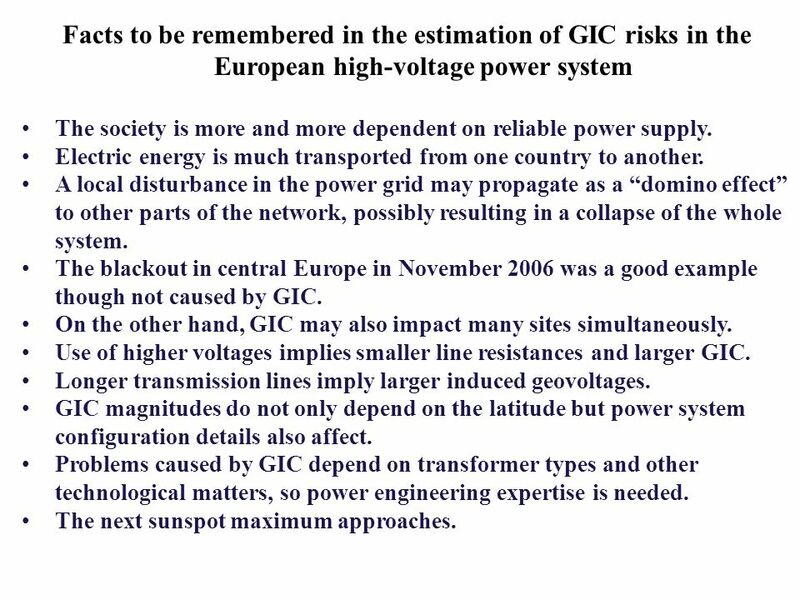 known power grid blackout due to GIC in Europe An overcurrent relay was too sensitive to the third harmonic of 50 Hz. It has been replaced by a less sensitive relay later. 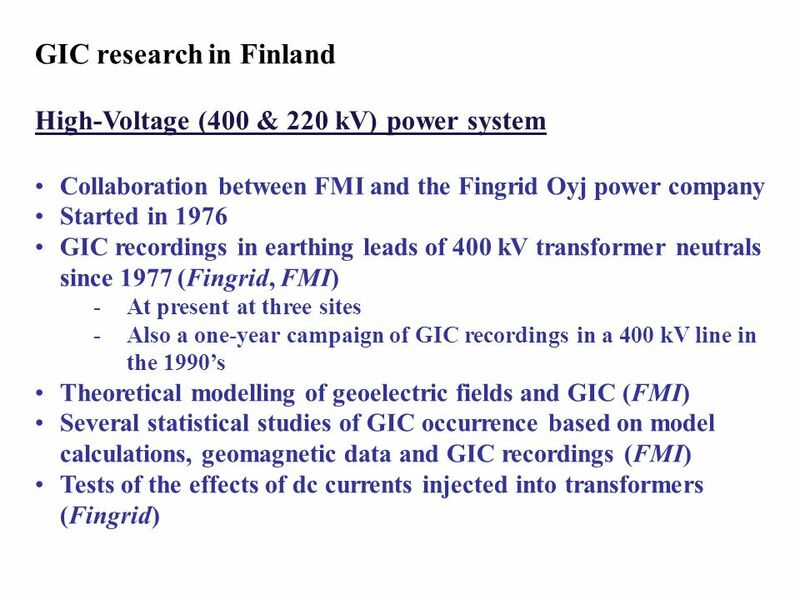 High-Voltage (400 & 220 kV) power system (continues) Conclusions: GIC are a potential risk in Finland due to the high-latitude location, so contacts between Fingrid and FMI continue. 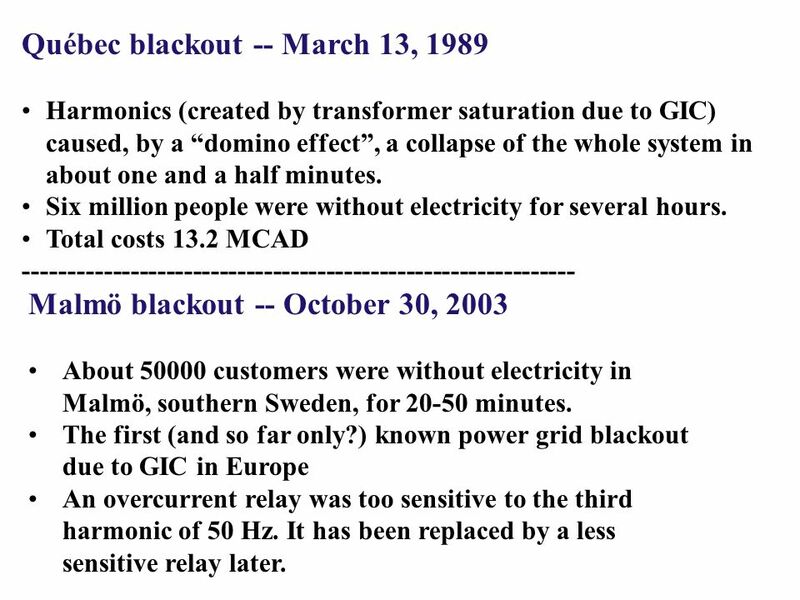 Largest measured GIC = 201 A (March 24, 1991); only 42 A on October 30, 2003 Only one GIC disturbance so far: A protective relay caused an unwanted tripping in northern Finland in January 2005 because the relay had been configured erroneously. The resistances provided by neutral point reactors efficiently reduce GIC. Series capacitors block the flow of GIC. The transformer structures and design specifications efficiently prevent overheating and gassing problems. 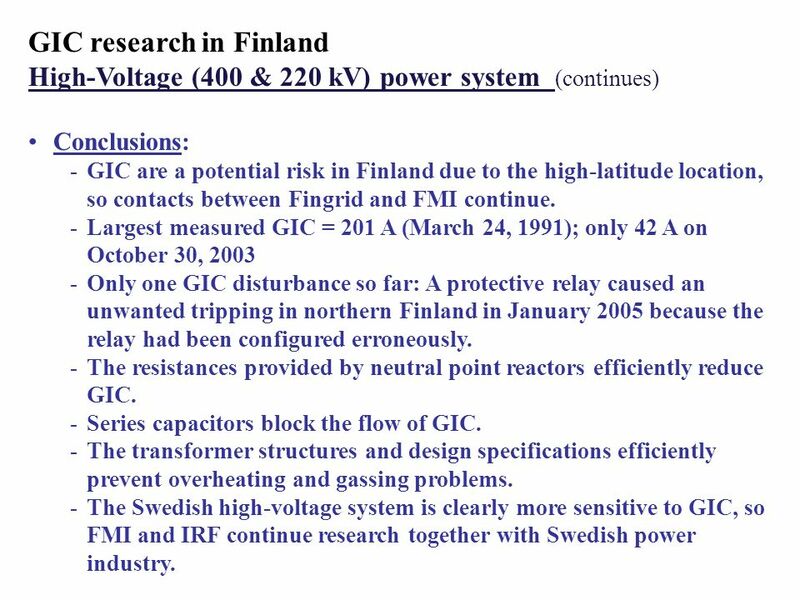 The Swedish high-voltage system is clearly more sensitive to GIC, so FMI and IRF continue research together with Swedish power industry. The society is more and more dependent on reliable power supply. 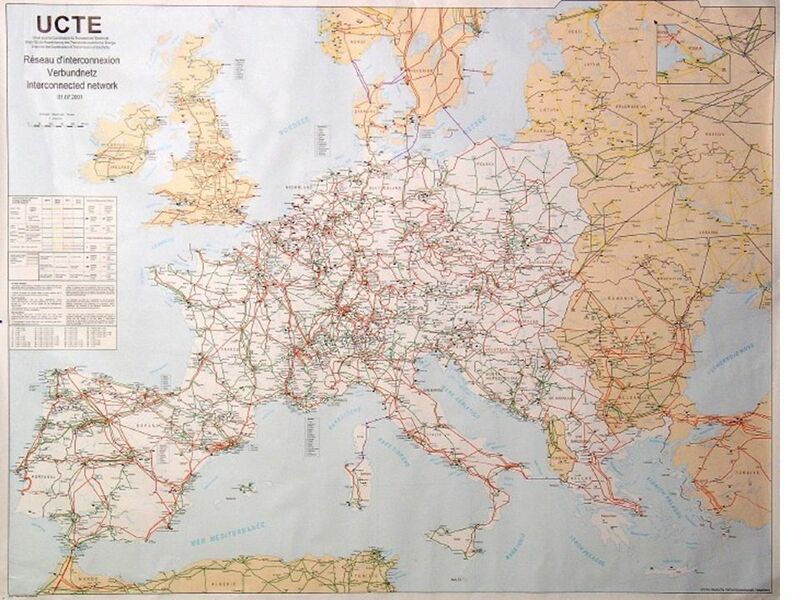 Electric energy is much transported from one country to another. A local disturbance in the power grid may propagate as a “domino effect” to other parts of the network, possibly resulting in a collapse of the whole system. 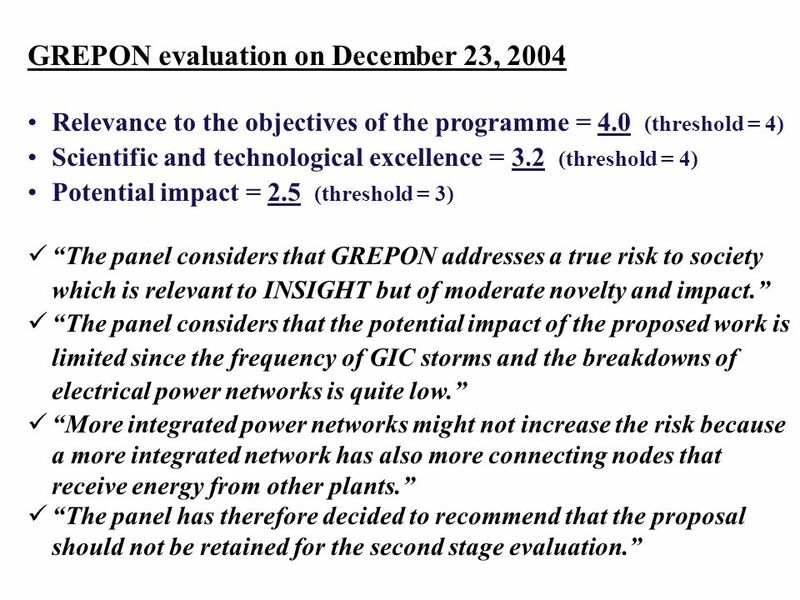 The blackout in central Europe in November 2006 was a good example though not caused by GIC. On the other hand, GIC may also impact many sites simultaneously. Use of higher voltages implies smaller line resistances and larger GIC. 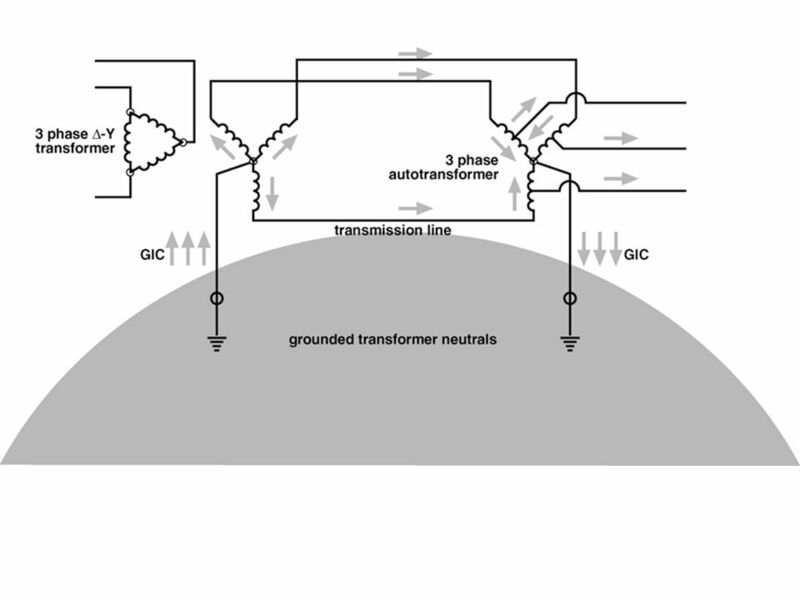 Longer transmission lines imply larger induced geovoltages. 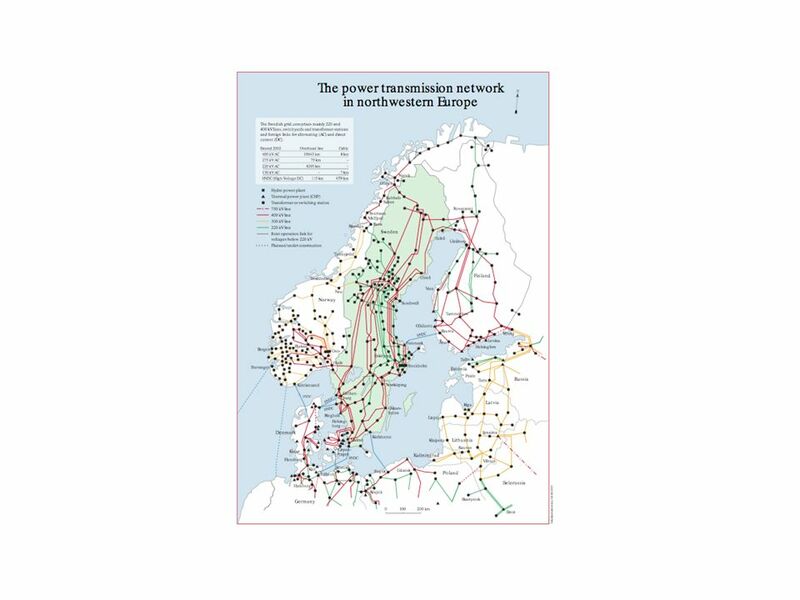 GIC magnitudes do not only depend on the latitude but power system configuration details also affect. 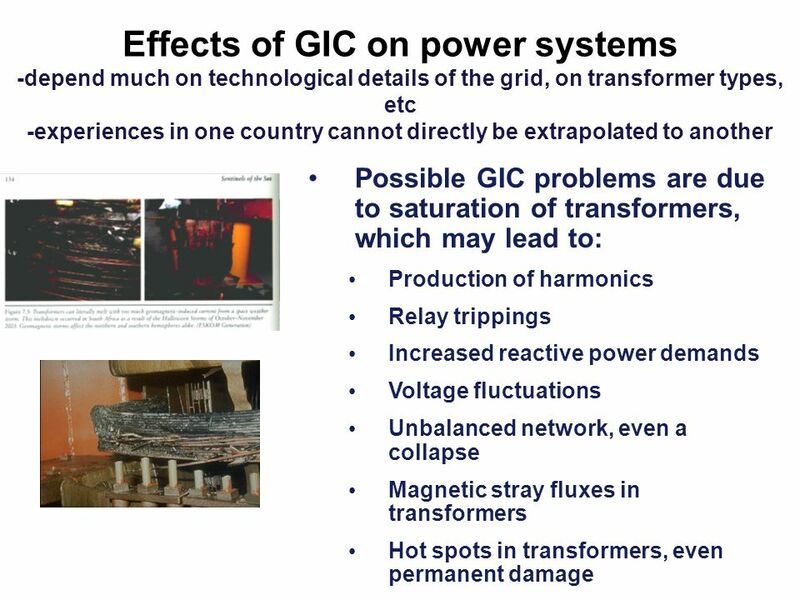 Problems caused by GIC depend on transformer types and other technological matters, so power engineering expertise is needed. The next sunspot maximum approaches. 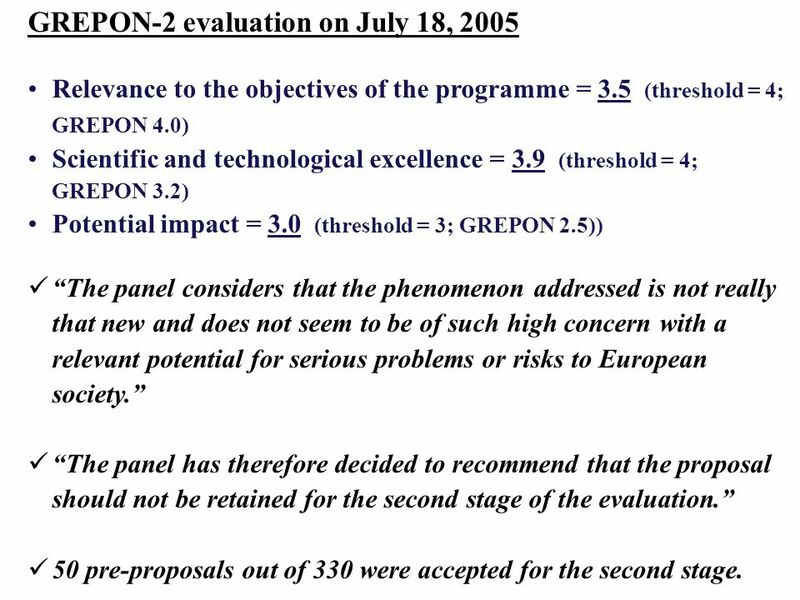 Relevance to the objectives of the programme = 3.5 (threshold = 4; GREPON 4.0) Scientific and technological excellence = 3.9 (threshold = 4; GREPON 3.2) Potential impact = 3.0 (threshold = 3; GREPON 2.5)) “The panel considers that the phenomenon addressed is not really that new and does not seem to be of such high concern with a relevant potential for serious problems or risks to European society.” “The panel has therefore decided to recommend that the proposal should not be retained for the second stage of the evaluation.” 50 pre-proposals out of 330 were accepted for the second stage. 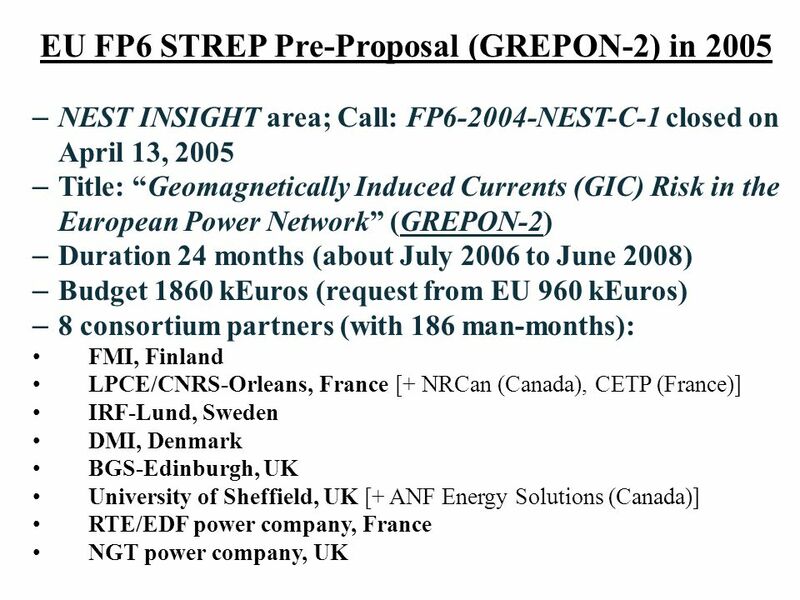 Download ppt "Space Weather & EU-FP7 Meeting"
ESWW4 5-9 Nov 2007 GETG Splinter Meting Pipe to soil voltages1 Comments to the study on the pipe-to-soil voltages induced in the Czech oil pipelines (Issues. 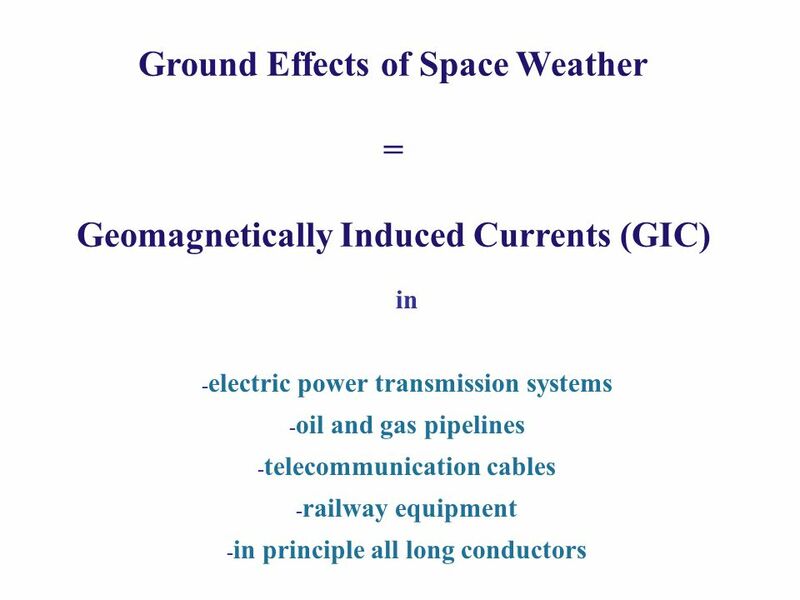 Ground Effects Topical Group Includes (but is not limited to) activities such as Modelling the occurrence of geomagnetic variations and geoelectric fields. 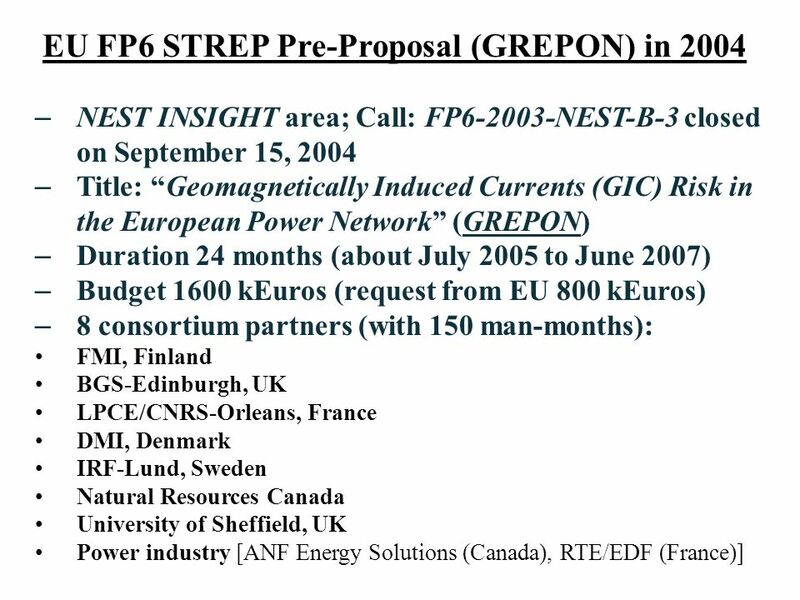 Ground Effects Topical Group UPDATES (less than one year) ProjectsProjects PublicationsPublications ConferencesConferences MeetingsMeetings Other newsOther. 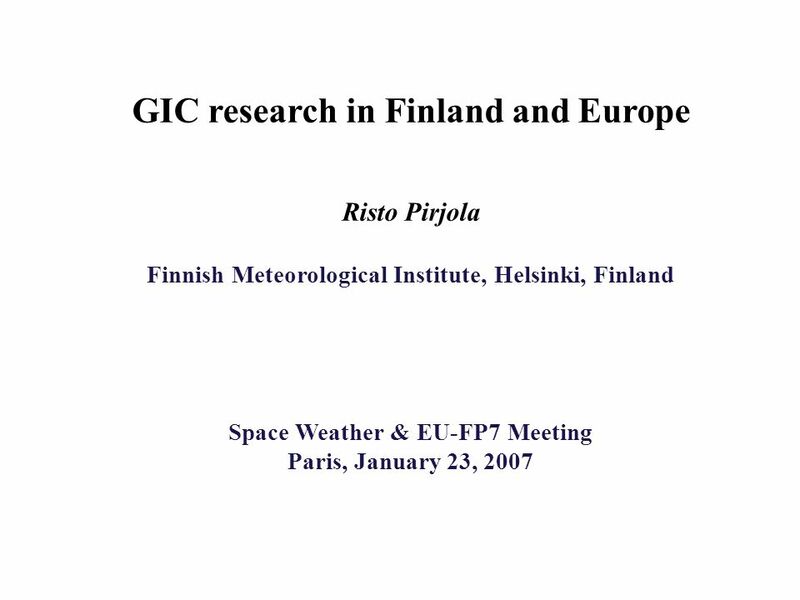 2 nd European Space Weather Week, November 2005 © NERC All rights reserved SWIMIC: Solar Wind Monitoring and Induction Modelling for Induced Currents SDA. 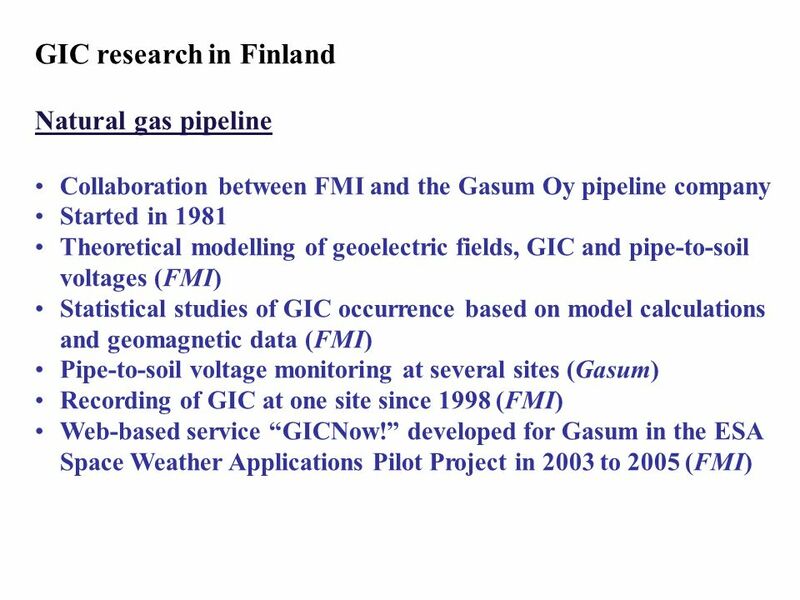 ESA Pilot Project: Real-time forecast service for geomagnetically induced current H. Lundstedt 1, P. Wintoft 1, M. Wik 1, L. Eliasson 1, Risto Pirjola. Assessment of fire risk in boreal forests under the present-day and future climate Andrea Vajda, Ari Venäläinen and Kirsti Jylhä Finnish Meteorological. 1 07/05/2009 The ERCs Peer Review evaluation process Helsinki University of Technology Espoo, Finland Mikko Paalanen. 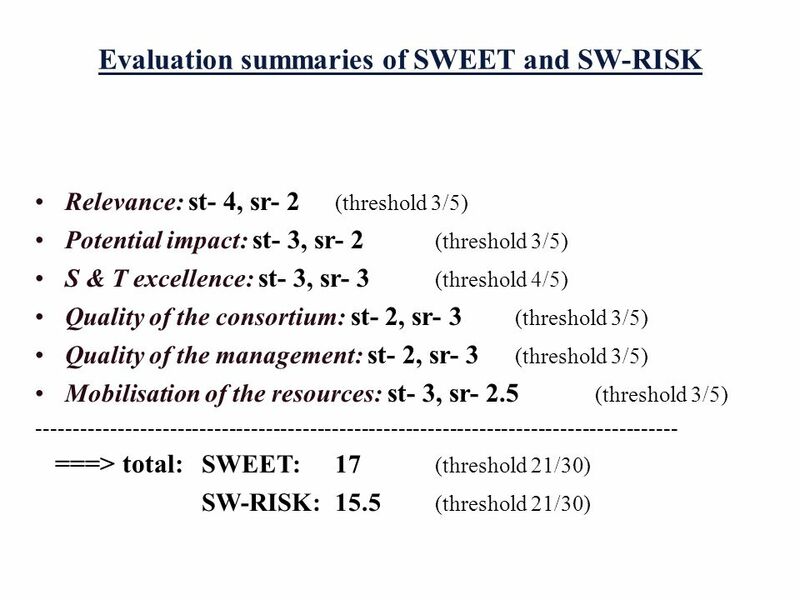 Shaping the railway of the 21st century Implementation of Retrofitting freight fleet Analysis of the EU funding possibilities Rail Freight Noise Abatement. The JRC Tsunami Model A. Annunziato Joint Research Centre of the European Commission Institute for the Protection and Security of the Citizen Support. Further investigations of the July 23, 2012 extremely rare CME: What if the rare CME was Earth-directed? C. M. Ngwira 1,2, A. Pulkkinen 2, P. Wintoft 3.